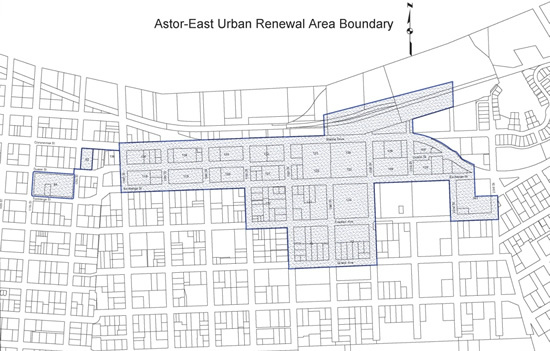 The Astor East Urban Renewal Plan (see below) was adopted by the Astoria City Council on September 20, 1980. The Astor-East Urban Renewal District is generally located in Astoria's Central Business District, south of the Columbia River to Franklin Avenue between 12th and 23rd Streets (see map below). The renewal area contains 56.95 acres of land situated entirely within the City of Astoria. Astoria has developed a renewal program that is having a significant impact on the appearance, livability, and economy of Astoria. The successes have been built on key strategic investments that have had spin-off effects on the downtown. Astoria's success illustrates how having a public funding tool available at the right time can have a major positive effect on development decisions. The primary objectives of the Astor-East Urban Renewal Plan are "to improve the physical conditions, functional relationships and visual quality of the urban renewal district and to eliminate blight in order to create a climate more conducive for private development, redevelopment and rehabilitation of property". The maximum indebtedness of the Astor-East Urban Renewal Plan is $17,113,718. The maximum indebtedness is the total amount of funding that can be spent on programs, projects, and administration in the Urban Renewal District. Projects authorized in the Urban Renewal Plan include improvements to streets, streetscape, traffic islands, parks, parking, access to the riverfront, and development and redevelopment assistance. Key projects undertaken in the district were redevelopment of the former Clatsop County Fairgrounds (18th to 21st & Marine to Exchange Streets), Liberty Theater (1203 Commercial Street), Columbia Memorial Hospital/OHSU Cancer Center (2158 Exchange Street), Astor Hotel (342 14th Street), and the Fort George Brewery and Public House (1483 Duane Street). The cornerstone project for the near future is the development of Heritage Square (1152 Duane Street) in the Downtown area.